Not so Traditional Deviled Eggs $1.50 Traditional deviled eggs with a variety of fillings including capers, fresh herbs, salmon, and chutney. Prosciutto wrapped Asparagus $2.50 Fresh Asparagus wrapped in prosciutto ham and glazed in brown sugar. Fruit Salsa and Cinnamon Chips $2.00 Finely diced seasonal fruit such as kiwi, strawberries, and oranges served with homemade cinnamon chips. Roasted Potato Skins $2.00 Roasted potatoes sliced and loaded with shredded Colby Jack, Hickory Bacon, and sour cream. 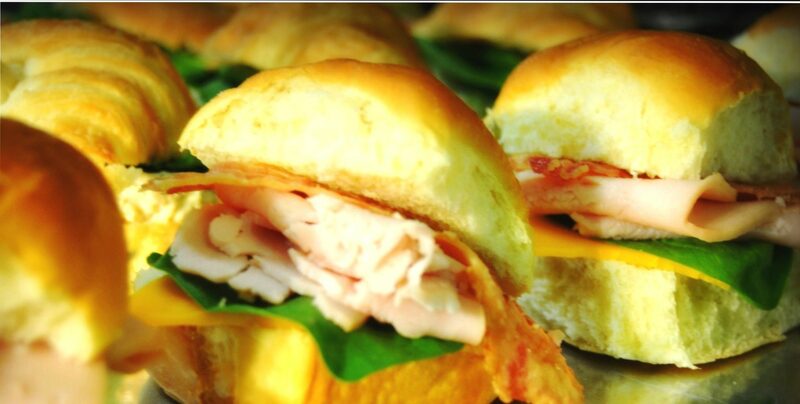 Tea Sandwiches $1.95 Chicken Salad, Honey Glazed Ham, Oven roasted Turkey on either mini croissants or sweet roll. Sweet BBQ Meatballs $2.00 2 oz bite size pieces served in a specialty BBQ sauce. Gourmet Petite Sandwiches $2.50 A selection of finer meats including pork tenderloin, salmon, grilled chicken, and pulled pork. Breads will include sweet roll, pumpernickel, and French roll. Duchess Garlic Potato Bites $1.25 Mashed potatoes seasoned with garlic and cheese piped into spirals and baked to create bite size crispy potatoes. Stuffed Olives $1.00 Green pitted olives filled with pimento, cheese, and peppers. 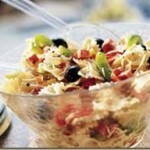 Pasta/ Potato Salad Cups $1.75 Assorted pasta and potato salad served in individual portions. Spinach and Artichoke Dip $2.00 Sautéed spinach mixed with cream cheese and marinated artichoke hearts. Seasoned and served in a breadbowl. Available as hot or cold dip. Assorted Stuffed Veggies $2.50 Assortment of veggies ( cucumber, tomatoes, peppers, mushrooms) stuffed with cream cheese, Ranch salad mix, or three cheese blend. Onion Soufflé $2.50 Warm dip served with a basket of crackers, breads, and chips for dipping. Cheese stuffed Ravioli $2.25 Ravioli stuffed with Italian cheese blend. Served with a hearty marinara sauce. Available as toasted crunchy snacks or fresh. 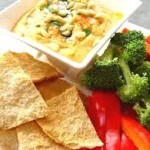 Hummus with Pita Chips $1.95 Traditional and Roasted Red Pepper hummus served with Pita chips. Grilled Smoked Sausage Chunks $2.25 Smoke sausage grilled to seal in the flavor. 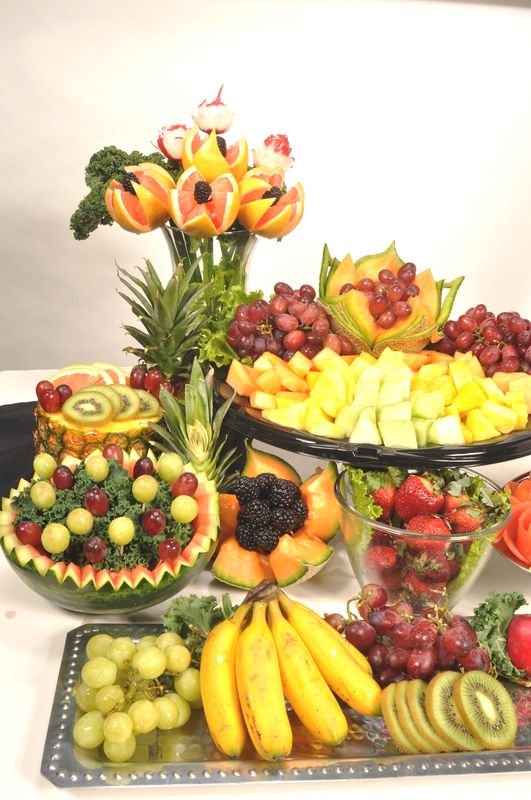 Flamboyant Fruit Display $2.75 Fresh cut fruit served around a decorative centerpiece. Includes Chocolate mousse and pina coloda fruit dip. Cheese Display $2.95 Artisan Cheese and crackers on a woodblock for guest to build their own snack. Olives included to top off this snack. Mushroom Caps $2.75 Baked Mushroom Caps stuffed with crab meat. Ocean Salad Tarts $2.75 Phyllo pastry cups and wonton wraps filled with chilled salad mix of crab and lobster. Coconut Shrimp $3.50 Fresh cocktail shrimp with a crispy coconut outside. Served with an orange marmalade sauce. 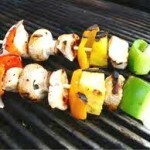 Chicken Kabobs $3.25 Petite Chicken chunks marinated in a specialty mustard sauce; threaded on skewers with peppers and mushrooms. Hawaiian Skewers $3.25 Mini Chicken kabobs with pineapple and cherry tomatoes served over a bed of rice. A soy and brown sugar glaze is the secret to these being loved by all. 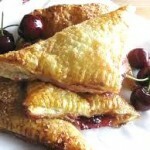 Lobster Turnovers $3.75 Golden Puff pastry filled with lobster and a spicy cream cheese spread. Served warm. 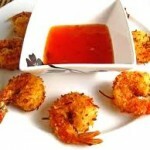 Jamaican Shrimp Platter $3.75 Fresh shrimp tossed in a jerk seasoning and sweetened by a touch of honey . Displayed on a platter with a mango and lime drizzle. Pork Kabobs $3.25 Pork tenderloin medallions broiled and then blasted with an apple reduction. Individual servings paired with cinnamon apples and skewered for an easy party dish.